Amidst all the tension and stress that comes with any major national karting event these days, there are also numerous stories throughout the paddock that remind us all of the passion that resides outside the track boundaries. A case in point is Franklin Motorsports’ Jamie Sieracki, the lifelong kart racer and industry member who during the off-season started getting the itch to drive once again. The 36-year-old Oconomowoc, WI resident is a vital member of the karting industry, as the owner of Franklin Motorsports alongside his father George. It’s a day-to-day program that includes running the shop, filling orders from their online store, and managing a trackside support program and team that brings a large group of Merlin racers to all of the major events in the United States, winning races and championships along the way. A passion for the sport is needed to be in this industry, but Jamie is also an incredibly skilled driver. When he’s coaching his drivers on technique or racecraft, the advice comes from years of experience racing for wins. This is a story that reminds us why a majority of us race karts. It’s about a passion for the sport, not a training ground or a stepping stone. 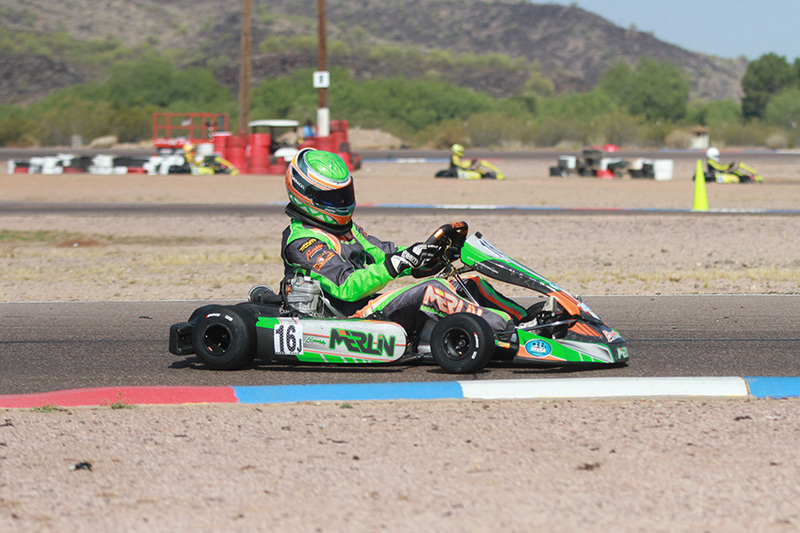 When Sieracki decided it was time to feed the desire to return to competition, he looked at the schedules and selected the SKUSA SpringNationals in Phoenix at the end of April. 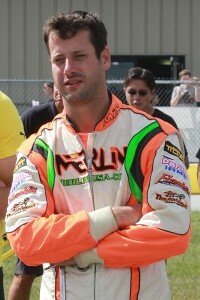 Over the years, Sieracki has jumped back behind the wheel on occasion, running in the TaG Senior category, challenging himself against the young bucks. But on this particular occasion, he made the move to X30 Master and, not surprisingly, he was right in the thick of things. There are many former star drivers who now watch from the sidelines, many who remain in the industry as tuners, coaches, team and/or shop owners. Sieracki’s primary motivation to run the SpringNationals was personal. His Franklin Motorsports team is solid, with self-sufficient mechanics and skilled fathers to manage the trackside operations in Phoenix. With a smaller driver line-up, the opportunity was there in front of him. Still, it was a late decision for Jamie to compete, and he rolled into the event admittedly a little intimidated by the established veterans in the Masters class. When we spoke after the event, he acknowledged that there are some seriously stout drivers in the category, all with stacked resumes. It was a who’s who of Masters racing, with pilots like John Crow, Scott Falcone and Derek Wang, all guys who have represented their country overseas in recent years. Add in all three of the reigning SKUSA plateholders – Nick Tucker, Chris Giumarra and Vatche Tatikian – as well as national frontrunners like Anthony Honeywell and Kevin Manning, and you have the strongest Masters line-up of the year to date. Sieracki knew what he was up against, and he has a great deal of respect for all of the drivers in the category. But he also has confidence in the equipment he sells, and this would also be a good opportunity to promote the Merlin chassis. And, even though he had a built X30 in the trailer, he told me that he opted for a stock IAME mill for the weekend. All in all, it was a solid weekend for Merlin Nation and Sieracki, especially on Sunday, as the team certainly made strides after going over Saturday’s data and reflecting on their performances. Sieracki ran in the top-five for most of Saturday but dropped to ninth in the final when the wet weather conditions struck for the first time, yet he turned things up overnight. 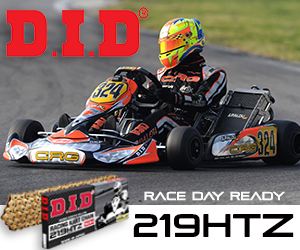 Jamie was in the lead group all day and emerged as the victor in the Sunday race to score his first SKUSA Pro Tour win. It was a pretty good day for a guy who hasn’t raced at this level in a few years. 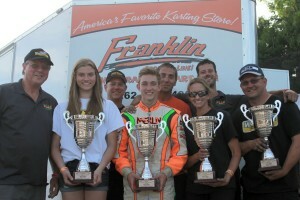 One key statement about Sieracki and the Franklin group is that they truly grasp the beauty of karting. You cannot argue the fact that they get the job done as a competitive squad, winning races and championships on the regional and national level, but you could easily argue that they do so having the most fun of everyone else in the stressed-out pit area. Inter-team trash talking is a none-stop barrage, and laughter is a commonplace. Post-race dinners with this crew are absolutely hilarious. You won’t find many big egos here, they get destroyed pretty quickly by your teammates and the crew. They say that a company or team’s culture comes from the top down, and with Sieracki, this is true. He’s a serious racer and businessman, but he doesn’t take himself too seriously either. It’s an ideal combination, and the entire group feeds on this atmosphere. Jamie’s a kart racer, and when we discussed the weekend in Phoenix on the phone the week after the fact, he hoped that his participation would draw a few others out of the paddock and back on track. We will see some of the former stars come out to play? That remains to be seen, but we did run into Phil and Everett Giebler on the way out of the teppenyaki restaurant on the Sunday night after Sieracki’s Pro Tour triumph and I’m pretty sure that I heard a dare get dropped….